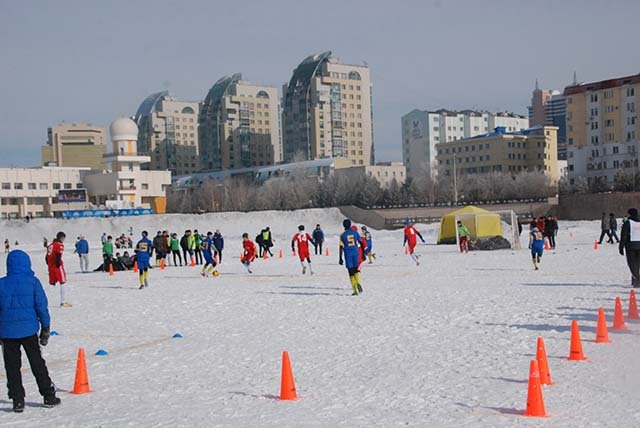 FIT Sports Adventure Travels organises in 2019 (marathon)ice=skating on the Ishim River and the Balgash Lake in Kazachstan. The Ishim River is 2.450 kilometers (1.520 miles) long. The upper reaches of the Ishim rives passes by Astana , the capital of Kazachstan. The river is frozen from the end of November up till March and in this period an icefestival is being organised. Local people will ‘create’ a fantastic ice-skating track on the Ishim River, with sufficient first aid tents and medical supplies to offer adequate health care. Every skater crosses the starting and finishing line and collects various stamps, marked on a card. The river runs through Astana; not only there but al the way along the track local people will offer significant encouragement with traditional music, being performed on traditional instrument, while dressed in specific costumes! The ice-skating will take place as part of a great Kazachian winter festival, where sports like cross-country skiing, rope pulling, weightlifting and icehockey are being organised. 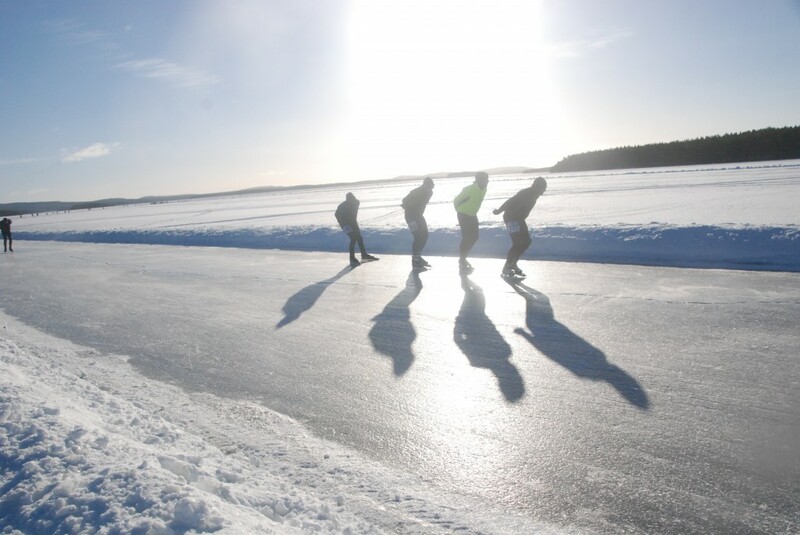 Dutch well-trained sportsmen (male and female) skate an ice-marathon. Also less-experienced skaters can paricipate in this event and/or choose their own distance. On the Balgash you cover a distance of at least 25 kilometers. The lodging premises are located in a ‘simple’ hotel in Torangalyk. Which ‘target groups’ might be interested? FIT Sports Adventure Travels considers the ice-skating events to ideally suited for skating clubs in search of adventurous and challenging events. Interest in teamwork, flexible attitude and a positive ‘outlook at life’ are essential prerequisites for registration for and participation in this event. Of course, individual ice-skating sportspeople are also more than welcome to register! The event is allowed to take place with a minimum number of 50 participants. In case the event has to be cancelled, you will be informed not later than February 1, 2016. When the minimum number of participants is registered, you will be informed respectively and accordingly. Arriving early in the morning you will be transferred to your hotel. After lunch time a bus-trip takes you to the ice-skating hall in Astana for a training session of 1 hour. Following that evening’s dinner you will have ample opportunity to privately explore the city. After breakfast a (2,5 kilometer/ 30 minutes) walk on the ice of the Ishim River will allow you to attend the opening ceremony of this Kazachstan Skating Challenge. The now opened ice-skating court is open for you as well as for the local people. In the afternoon you may attend skating clinics performed by professional Dutch marathon skaters. Following the end of today’s program the return walk over the ice of the Ishim River takes you back to the hotel in Astana, where dinner is awaiting you! Following breakfast, the (2,5 kilometer/ 30 minutes) walk on the ice of the Ishim River brings you again to the ice-skating hall. Enjoying your leisure time you will have ample time to skate together with professional sportsmen (male and female), who are in full training here on these premises. You may even participate in afternoon clinices being executed by Dutch top skaters. After breakfast, the (2,5 kilometer/ 30 minutes) walk on the ice of the Ishim River takes you again to the ice-skating hall, where a 200 kilometers marathon for professional skaters is about to start! An alternative option in today’s program leaves you the opportunity to explore the city of Astana. For example you may choose to visit the presidential palace of Ak Ordas or the Khan Shatyr (Royal Tent), an enormous transparant, tent-shaped ‘building’. It reaches the height of 150 meters and ‘covers’ a territory of 140.000 square meters, containing shops, midget golf premises, a park, a small river and an indoor beach centre. The paved streets lead to many sites where a vast variety of events are to take place. Today’s dinner is served back in the hotel. Following breakfast a train-trip takes you to Lake Balgash. During this ride the rural landscape provides a completely different impression as compared to the luxury of Astana. 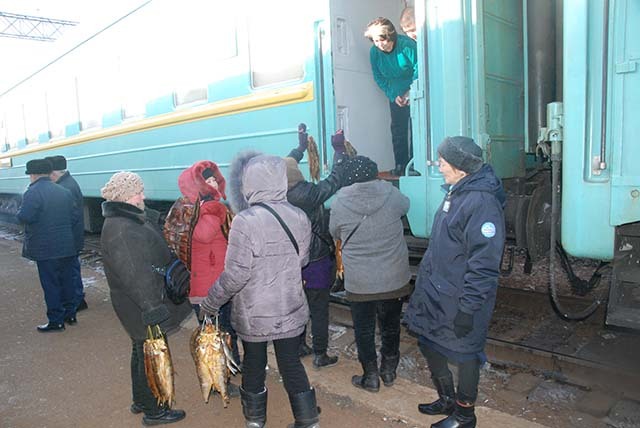 While making various train stops , local people may try to sell their traditional food, e.g. fish. Today’s afternoon allowes you to take lodgings in an hotel with ‘basic’ features, where you will enjoy your dinner. Local people have installed an ice-skating track of 25 kilometers. On both days you will have ample opportunity to skate the 25 kilometer track that is being installed by the local people here. Following dinner at the end of DAY 8 a night train will take you to Almaty. 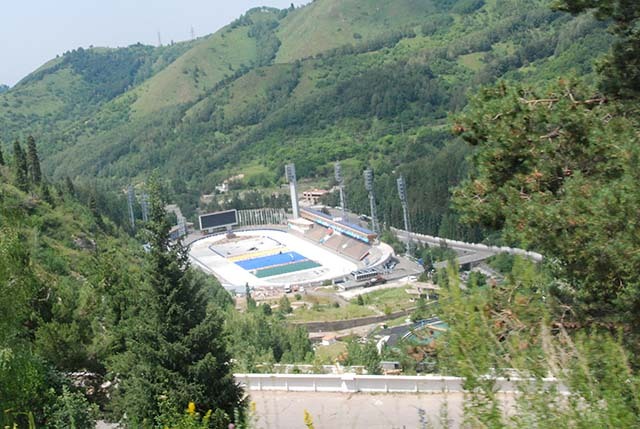 In Almaty you will check in in an hotel, followed by a sightseeing tour through town and a trip to Medeo with its most famous ice-skating premises in Kazachstan. Situated at 1.691 meters high above sea level, this skating track is at the highest altitude in the world. Because of these extraordinary circumstances in the Medeo valley, prevailing winds support the skaters along their way. You will have the opportunity to ‘experience’ these special skating conditions! If times and circumstances aloow this, one may fin dan opportunity to visit the winter sports centre of Chymbulaq. Dinner is privately booked for on basis of personal initiatives. Early in the morning of this first day you leave for a 2-day trip to Kolsai. There you visit the Charyn Canyon in the National Park, bearing the same name and being described as ‘the small brother’ of the Grand Canyon in the United States of America. The Charyn Canyon extends to a length of 150 kilometers and reaches a depth of 300 meters at particular spots. A location of special are tob e found in the 2 kilometers long Valley of Castles, where stone pillars and rock formations form impressive,almost artifical structures. Your lodgings are to enjoyed with a local guest-family on basis of breakfast and lunch. On DAY 11 a bus-trip takes you back to Almaty. You will have ample opportunity to privately spend this day in Almaty. Options to get some ice-skating and/or skiing done in Medeo are available, but are not included in the price indicated here. The evening program contains folklore music and dance. After breakfast a bus-trip takes you Almaty International Airport, where the plane takes you back to The Netherlands. International flight to Kazachstan: ± € 500,= (depends on the time of booking; early booking might yield a lower price!). Either you arrange your own visa or ask FIT Sports Adventure Travels to do this for you, by indicating so in your final reservation. To apply for a visa you need a passport, valid for at least 6 months following departure to China.